Water rushed forth into the A Canal in Klamath Falls Tuesday afternoon as Fritz Frisendahl and Scott Cheyne of the Klamath Irrigation District opened the headgates via the control panel. Between 20- and 40-cubic feet per second of water is now traveling through the canal, about as much water to fill about 20 bathtubs per second, according to Gene Souza, manager of the Klamath Irrigation District. Frisendahl, who helped turn on the headgates, has been through some tough water years in the Klamath Basin, including the 2018 drought. “Last year, you’d go forward and then you’d come back,” Frisendahl said, referencing the start-and-stop water year, which was also delayed due to drought conditions. The water flowing from Upper Klamath Lake, which carries a strong aroma of algae and decomposing biological bi-products, is delivered through the canal system to approximately 230,000 acres in Southern Oregon and Northern California. Irrigators can expect to see the water to reach irrigators in upwards of 10 days as water reaches the full Project. Souza was on hand for the opening and enthused about the outlook. “When I interviewed for the position in January, the outlook was not as good as it is this year,” Souza said, prior to multiple snow and rain events. Simultaneously Tuesday, Bureau of Reclamation’s Klamath Basin Area Office released its 2019 biological opinion. (See related story). Souza expressed appreciation of Fish and Wildlife Service, National Marine Fisheries Service and Reclamation for their work to finish the document, which ensures the Endangered Species Act is followed as water is managed and delivered to water users in the Project. Souza also shared concerns over the amount of water available to B Contract water users under dry conditions, according to the document. Souza said there’s a potential to start working on a new biological opinion “fairly soon,” for which there is no current timeline planned as of presstime. Jeff Nettleton, manager of the Klamath Basin Area Office, expressed enthusiasm over the outlook, which has significantly improved from that of eight weeks ago. Snowpack as of Tuesday afternoon is up to about 129 percent of average for the Klamath Project, with precipitation resting at 98 percent. Nettleton told irrigators late last month they could anticipate a projected 93 percent allocation, pending the release of the official number, which should be released later this week. Nettleton addressed concerns by some Project irrigators over a long-term solution as well as having a less-than-100 percent allocation. Nettleton emphasized long-term, it’s hard to have certainty for irrigators without knowing how much water is available each year. With advanced notice, Nettleton said he’s willing to sit down individually or with a group of irrigators and go over information regarding water allocation specifics. Those interested in learning more should contact Laura Williams at Reclamation’s Klamath Basin Area Office at 541-880-2581 or by email at lwilliams@usbr.gov. 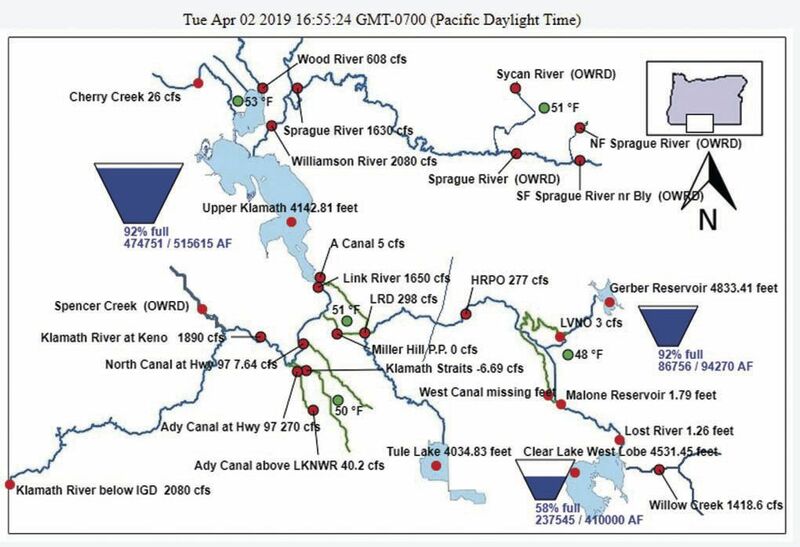 The Bureau of Reclamation announced Tuesday that it has completed all steps necessary to transition to a modified operating plan for its Klamath Project, which delivers irrigation water to approximately 230,000 acres in southern Oregon and northern California. Reclamation issued a finding of no significant impact related to its modified water management approach for project operations between 2019 and 2024. The approach is consistent with coordinated biological opinions issued on March 29, 2019, from the National Oceanic and Atmospheric Administration’s National Marine Fisheries Service and the U.S. Fish and Wildlife Service. The biological opinions analyze the effects of the ongoing Klamath Project operations on federally listed species, including the endangered Lost River and shortnose suckers and threatened coho salmon. NMFS and USFWS concluded that Reclamation’s modified operations plan for the Klamath Project is not likely to jeopardize the continued existence of federally listed species or result in the destruction or adverse modification of their designated critical habitat. “Our water management approach is reflective of an extensive science-based effort that aims at creating greater reliability and certainty for all resources,” said Bureau of Reclamation Mid-Pacific Regional Director Ernest Conant. The re-initiation of consultation included a robust process that provided for an increased level of engagement and collaboration with six federally recognized tribes and key stakeholders including Klamath Project water users. “Our biological opinion uses the best available science in determining that the Klamath Project will not jeopardize coho salmon or other listed species in the Klamath Basin,” said NOAA Fisheries West Coast Regional Administrator Barry Thom. Additional information on Klamath Project operations and anticipated water supplies will be found in Reclamation’s 2019 Operations Plan, which is expected to be released during the first half of April.